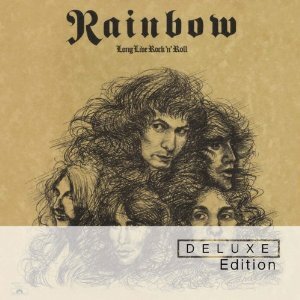 Rainbow are releasing a Deluxe edition of "Long Live Rock 'n' Roll". It was the band's third studio album and was released in 1978. It was Rainbow's last album to feature Ronnie James Dio on vocals. Rainbow are one of the legendary names of Rock and featured some amazing members including Ritchie Blackmore, Ronnie James Dio, Cozy Powell, Roger Glover, Don Airey, Graham Bonnet, Joe Lynn Turner and more. The original album is so well known that I won't dwell on it, but this deluxe edition has far more to offer than just the basic album. While the original album had a running time of just over 41 minutes, the deluxe edition has that plus an hour and ten minutes of bonus tracks. So what are the bonus tracks? Well we get rough mixes of seven of the songs from the album, a song recorded at an L.A. rehearsal in 1977, and six songs taken from their live performance on the Don Kirschner show in 1978. The rough mixes all sound good and are definitely worth a listen, but the live performances are the best part of the release for me and all sound great. This is one of those re-releases where even if you have the original album it's still definitely worth buying the Deluxe edition - it's got so much extra stuff that it really is an essential purchase. Unlike some CD's where the bonus disc is fairly weak alternate versions of the album songs, this is a case where you won't just listen to the original album again and again, you'll be listening to the bonus material again and again too. An excellent re-release of a classic album. Long Live Rock'n'Roll (Deluxe edition) is out now.